I (and maybe, the rest of Boice fandom) received a pleasant surprise on Sunday night, midnight on Korea. 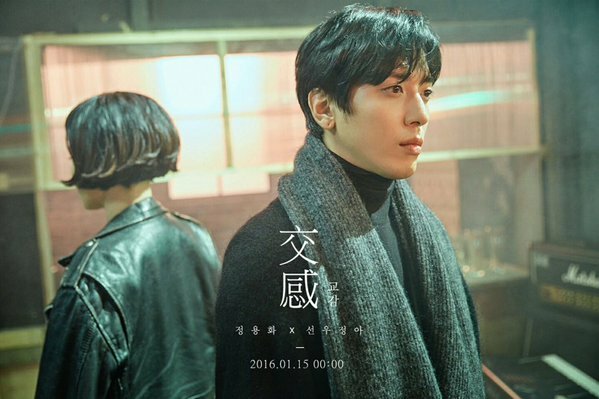 FNC (CNBLUE's company) suddenly released a teaser for YongHwa's collaboration with Sunwoo Jung-A. So, every night, as a diligent follower, I waited every 11PM(12AM KST) for the new update- from teasers to album cover to finally the music video. Thank goodness for time difference! It turned out that YH and SJA wrote 2 songs together. It's the typical "What YongHwa Wants, YongHwa Works Hard and Gets It" moment. It's funny how he had a lot of subtle hints on his Instagram posts. Last year, while he was promoting his solo album, he mentioned that he wants to collaborate with SJA because of her unique voice. SJA is actually a producer for YG Entertainment and worked with GD/TOP (BigBang) & 2NE1, She also released her critically acclaimed album and won "Artist of the Year" award. I honestly just read about those during their current promotions but hearing "Spring Girls" made me go all in in this collaboration project! For "Hello" track, the music was by YongHwa and they collaborated on the lyrics. It's a ballad and their blending is heavenly! "The winter sings the love of you" blending is so awesome (for the lack of better word to describe it). I was actually expecting a Jazz track but this is a pleasant surprise! The song "light a fi-re, right in my heart!".. "Fireworks" is a dance pop song, the music was c/o SJA and they both wrote the lyrics. I'm really impressed with how YH is pushing the boundaries in his musicality by collaborating with senior artists rather than doing the expected route (for Boices, I think) - duets with his idol friends Ailee and IU.